Topa Topa x Institution collaboration! We will be hosting three events with our friends from Topa Topa this October. Our first stop this month is going to be at Ojai Deer Lodge from 7pm-11pm. We will be pouring Mosaic, Virtue, Ratched, Static and Chief in Confinement! Plus Topa Beerssss! 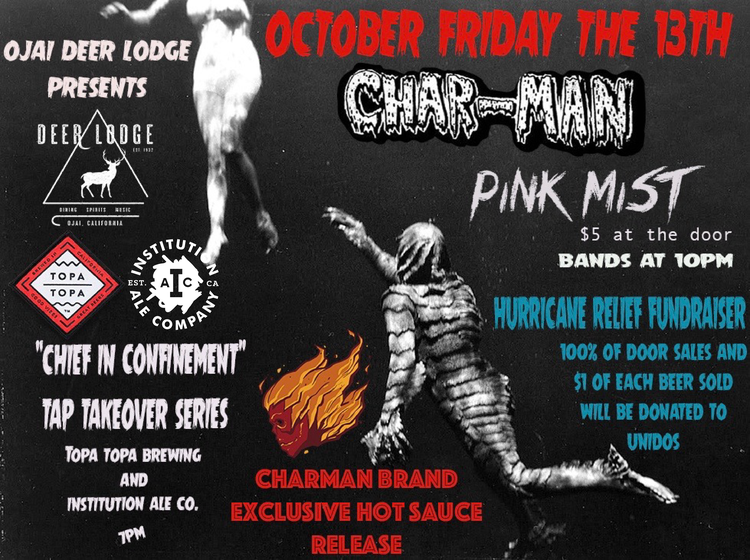 There will be live music starting at 10pm by Char-man & Pink Mist. We will have limited release glassware for keeps if you buy a pint of our special collaboration beer, Chief in Confinement. Chief in Confinement is our White Walls base beer, dry hopped with Topa Topa’s Chief Peak dry hop regiment.